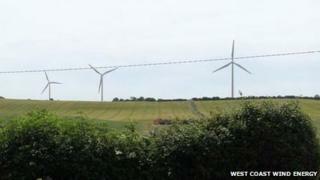 Plans for a wind farm in Dorset have been scaled back following complaints from local residents. Developer West Coast Energy, which was planning to erect nine turbines near Tolpuddle, reduced the numbers to five after a "period of reflection". Campaigner David Peacock insisted "even one turbine would be too much". Brian Heatley of the Green Party said such renewable energy schemes would combat "extremely damaging climate change". The company said it would also reduce the height of its turbines from just under 130m (425ft) to 115m (375ft) following consultations with residents. "The decision has been taken to seek to reduce the scale of the wind farm as a means of addressing the main concerns," a statement said. Leader of West Dorset District Council, Robert Gould, said he remained "unconvinced" by the revised plans. "It is not the right place for such a large scale development," said Mr Gould. "We rely heavily on tourism, it's very important we have an attractive, welcoming environment," he said. David Peacock, of Tolpuddle Against Industrial Turbines (Taint), said the revised plans did not meet the group's concerns. "We are supportive of renewable energy but it's a question of these turbines being alien in a high-value landscape. "It's not needed - there are other sources of renewable energy which west Dorset is well endowed with. Mr Heatley said the impact on the landscape was secondary to the need to reduce fossil fuel consumption. "We're running the risk of something catastrophic - runaway climate change. "I love the landscape around Dorset but we'll only preserve that in the long term if we preserve our climate."